There are many things to consider when thinking about baby safety in the home. The different rooms in your house, stairs, table corners, electrical sockets, and even if you have a pool. Some hazards are not an issue until the baby is more mobile. Then you may have to take into consideration what the baby is able to reach that can harm them. Other things that can harm baby are objects, such as dressers, that can fall on the baby if not properly secured. Many products exist in today’s world that can be used to help keep baby safe in your home. Move hot liquids, such as coffee and tea, out of baby’s reach. You may even consider using a travel mug to reduce the chance of spills. When cooking, turn pot handles inward. Whenever possible, move pots to the back burners. Keep cleaning products and other chemicals in a locked cupboard, preferably a top one. Store plastic bags and boxes of aluminum foil in a locked cupboard as well. Store knives and other sharp objects in a latched drawer. Keep your water heater set at 120 degrees to minimize scalding. You can also check the water’s temperature with your elbow to make sure the water is not too hot or too cold. Never leave your baby unattended in the bathtub. Children can drown in as little as one inch of water. Use toilet seat locks to prevent your child from playing in the water or clogging the toilet. Keep medicine in a locked cabinet or on a high shelf. Remember, just because something is child-resistant does not mean it is child proof. Use a non-skid floor mat to prevent slips and falls. 1. The crib must have fixed sides as drop-side cribs pose a serious threat to infants. 2. Crib slats should be no further than 2 3/8 inches apart to prevent your baby from trapping their head or limbs in between them. 3. Corner posts should not be over 1/16 of an inch unless they exceed 16 inches as your child’s clothing can become caught and cause strangulation. 4. Crib mattress must be firm and tight fitting so that your baby does not become trapped between the mattress and the side of the crib, resulting in injury or suffocation. You should not be able to fit more than two finger’s width between the mattress and the sides. Avoid blankets, bumpers, stuffed animals, and positioners as they could potentially suffocate or entrap your child. Anchor tall furniture to the wall to prevent it from falling on top of your child and secure the drawers to discourage your toddler from climbing open drawers. Once your child is 35 inches tall or can climb over the side of the crib, they should be moved to a toddler bed. Attach a guard rail to ensure that your child does not fall off the bed. Pajamas should fit snugly as children’s clothing is not flame-resistant. If you still do diaper changes, the same rule still applies to the changing table; never leave the child unattended and always use the safety strap. Toy boxes are an unrecognized hazard, however, the lid can slam down on the child and smash their fingers or trap the child inside should they climb in. Cover edges and corners so that when your child starts to become mobile they do not get hurt bumping into them. Get down on your hands and knees and move anything down low that may be a potential danger to your child as they become mobile. 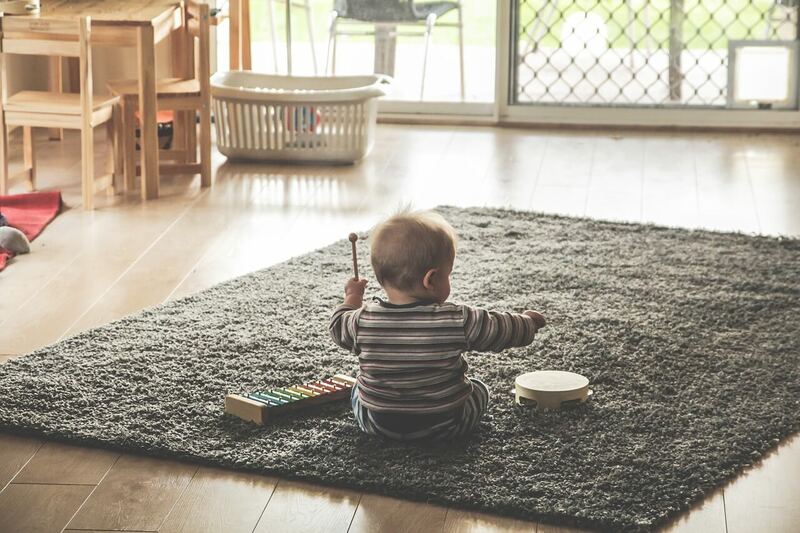 Lay down a non-slip rug if you have hardwood floors to reduce the chance of your child slipping and falling. More than 250 kids drown in the US every year in pools and hot tubs so pool safety is very important. Build a fence, this is a much better alternative to a pool cover which can buckle under the child and entrap them. You can opt for a rigid pool cover which can withstand the weight of a child on it. If you have an in-home security system it can alert you when your child attempts to go outside. You should also install locks to make it more difficult for your child to go outside without you. Make sure the car seat is properly installed using the vehicle’s seat belt or the LATCH system, never both. The middle of the back seat is the safest place for your child. Keep your child rear facing for as long as possible to keep them safer in the event of an accident. Be sure that your child is in the proper car seat for their height and weight. If you choose to decorate with plants, make sure to keep the soil covered and that the plant is not hazardous. Remember to get on your hands and knees to see your home from the child’s perspective and to eliminate hazards that are down low or things that may attract your child as they become more mobile. These objects can include but are not limited to loose change, rubber bands, and pens. Make sure to put away any small objects that could become a choking hazard if your baby were to put the object in their mouth. Use stationary play centers instead of walkers to prevent the child from falling down the stairs while using it. Install smoke and carbon monoxide detectors on every level of your home and in hallways. Keep your first aid kit stocked in case of an accident. Have at least one landline in your home as cordless phones do not work when the power is out and cell batteries can run out. You would be surprised at how easy it is for your baby to get into trouble. Here are some other things to consider when baby proofing your home. Baby proofing should be done sooner rather than later as it can get you and your child into the habit of what is and is not off limits. Covering outlets in the home with plug outlets to prevent your child from getting shocked or sticking objects into them. These will keep your child out of rooms that are unsafe and to prevent them from falling down stairs. This will allow you to check on your child while they are in another room during sleep times or to monitor play times. These will prevent your child from going outside or falling out of a window. Childproof with safety locks to prevent heavy objects from falling on your baby or them getting medications or chemicals. If possible, move chemicals and medications to a higher cabinet. Tall furniture should be properly anchored to the wall to prevent it from falling on top of your child. Also, anchor your television to prevent that from falling. Sharp corners and edges should be covered to prevent the child from bumping into them when they become more mobile. Make sure that your furniture can withstand the weight of a child throwing their weight on it or climbing it. Consider anchoring your stove and refrigerator to the wall as these items can also tip over if your child were to climb on them. This will allow you to keep an eye on your child anywhere in the home while you get things done. A guardrail on your toddler’s bed to keep the child from falling off of the bed while sleeping. Typically toddlers transition to a bed between 18 and 24 months. If possible, go wireless to keep your child from tripping or chewing on the cord and strangulation. Keep all cords organized and out of reach. Minimize clutter as much as you can to keep your child from making a mess or potentially hazardous items. This includes keeping toys cleaned up to minimize falls. There are many things to keep in mind when it comes to keeping your immobile newborn safe. Your baby’s head should always be supported when holding him or her and you should be mindful of the baby’s soft spots. This is a great time to bond with your baby whether you choose to breast or bottle feed. Choose a comfortable place to sit and relax. Be sure that baby is propped in your arms correctly. Breastfeeding moms may want to have water net to them as breastfeeding makes you very thirsty and a support pillow to help with positioning. Talk to your baby while you feed him or her. Do not lay baby down and never prop bottles when feeding. There are many things to keep in mind when it comes to sleep safety. Your baby should always be placed in a crib or bassinet to sleep, never in your bed. This will prevent the baby from being crushed or suffocated during sleep. Your baby should also be placed on their back as newborns are not yet strong enough to turn their heads to keep from suffocation and this reduced the risk of choking. Keep the bassinet or crib clear of blankets, bumpers, stuffed animals, positioners to reduce the risk of suffocation. Place baby in a wearable blanket or a sleep sack to keep them warm and comfortable while sleeping. All of these things will reduce the risk of SIDS as well. When dressing your newborn, a good rule of thumb to follow is to dress them in whatever you have on plus a layer, such as a blanket, to ensure that they are warm enough. Hold baby in your lap when dressing him or her to help keep baby warm as babies do not like to be cold. For the first couple of weeks, your baby should only be given a sponge bath to keep the umbilical cord dry. Once this falls off, you can give your baby a bath in a special infant tub. Make sure that your water heater is set at 120 degrees to prevent scalding. Place a warm washcloth over baby’s belly while washing their hair to keep them warm. Remember to keep baby’s head supported while washing them. After, wrap baby in a towel to dry them and quickly dress them as baby will be very cold after a bath. Most parents prefer an evening bath because this can make it easier for the baby to fall asleep. Baby proofing is one of the most important ingredients in child safety. There are many things to consider and keep in mind when baby proofing your home. At-home accidents can be prevented if the proper safety measures are taken ahead of time. Baby proofing your home is easy and can be accomplished in a few hours or over the course of several months depending on how prepared you prefer to be. Many products exist today that can be bought to put in your home to keep your baby safe. To keep from getting overwhelmed, start baby proofing as soon as possible and with one room at a time. You should also start with the bigger causes of injury such as the stairs. There are also videos to help show the proper installation of things such as baby gates and furniture anchors if you are unsure. Your attention to your child will also go a long way in keeping them safe. The more present you are with your child, the more aware you become of their surroundings and the safer your home will be. All parents need a break so if you need to step away from your baby, ask a friend or place your baby in a safe contained place with toys while you sit and relax. As long as you follow these tips, you can ensure that your baby will be much safer in your home.